You may not even know that we’ve been inoculating logs for the past month, but we’re now finished! Every year we inoculate mushroom logs. This is because mushroom logs do the vast majority of their production in the second, third, and to less extent their fourth year of their lives – at least the way we do things. So we’ve got to keep replacing the logs that become unproductive. Inoculation is the process of transferring mushroom mycelium from one growth medium to another. In this case, we expose fresh logs to sawdust spawn – which is mycelium (the mushroom organism) growing on sawdust. I’ll say more about how we do that later in this post. During the months after that, the mycelium grows from those inoculation sites into the rest of the wood in what we call incubation. The first step however is to get logs. For shiitake you should pick logs that are green and live, and harvested when they are dormant – or about September through March in Minnesota. Oak works particularly well for shiitake. 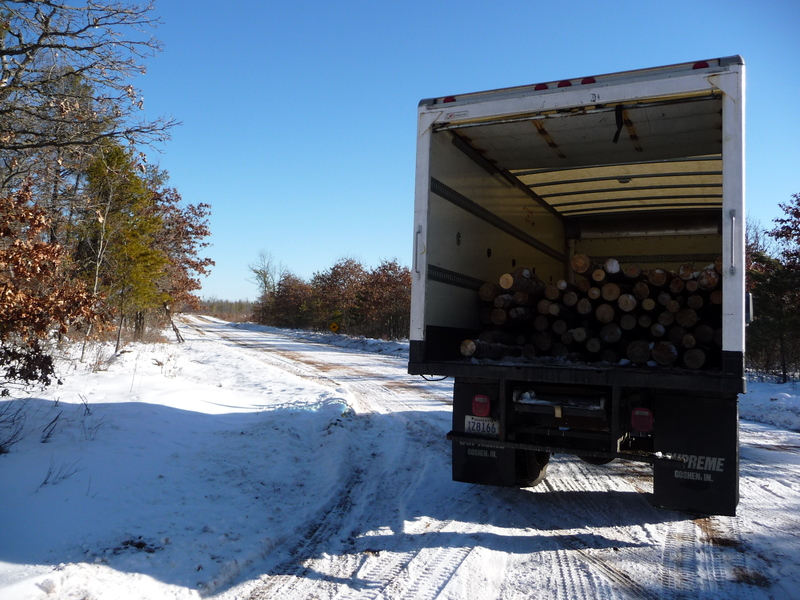 This February we picked up a batch of burr oak logs – 500 to 600 – near Malaca, MN. I bought them from a logger up there who had won a contract with the DNR for a few weeks of cutting. He uses the largest equipment I’ve ever seen for this, so he had no difficulty navigating our deep snows of February. On the other hand this sort of hauling and cutting equipment is geared to cutting 8 foot – 6 inch logs, so we had a lot of cutting to do even before we loaded to cut them down to manageable 4 foot lengths. Oh, and because of the equipment he used, the bark (which holds in moisture and protects the log from drying out) was heavily damaged. But no one else volunteered to cut logs for me in February! We packed the logs into a moving truck, and drove them down to a warehouse in Bloomington, where we unloaded and stacked them. That day I figure my helper and I each moved about 30,000 pounds of logs! 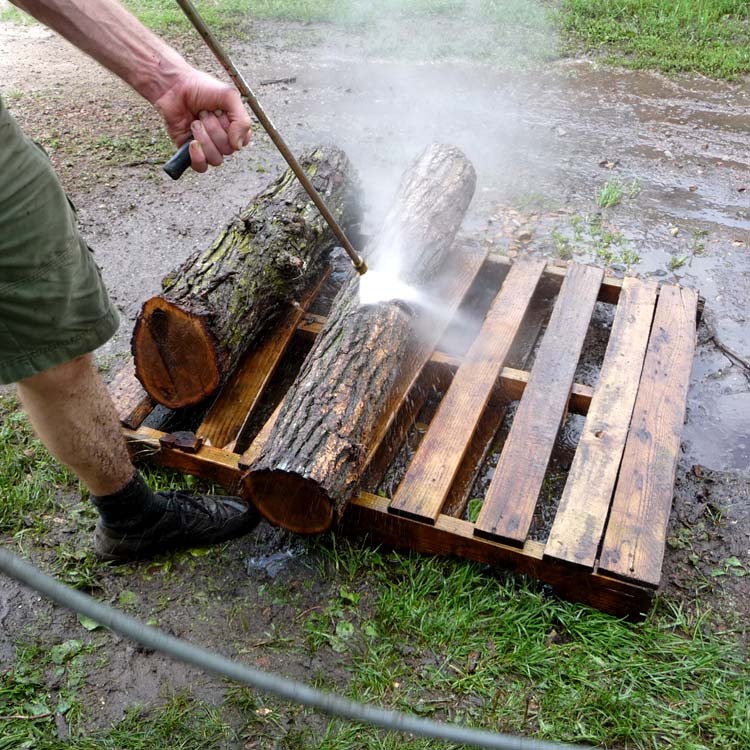 The following few days my team and I power-washed the logs in the warehouse. The photo here is from last spring, but this year it had to be inside, since we were processing the logs early. Washing removes lichen and moss from the logs – which can lead to mold problems. Our washer was pumping out 3 to 5 gallons per minute though, and our floor drain just couldn’t keep up with the sludge of water and bark debris! Once they are clean of that, we stack them in such a way that they will dry off in a day or two. Once dry, we moved them to the Ham Lake farm, where we stacked them in preparation for log inoculations – whew! This year we’re doing the work in a garage at the new Ham Lake farm. Thank you members of the Sannerud family and the Sandbox Coop for a great space and hospitality! The first step in inoculation is to drill holes in the wood. We use an angle grinder with an adapter because of it’s high speed and power, and a special drill bit used for this purpose that has a stop so that the hole is just the right depth. I use a diamond pattern so that all parts of the log have an equal chance of getting colonized by the mushroom mycelium. Each log may have between 50 and 250 holes in it, depending on the diameter of the four foot log! And with the spacing and logs that I use, we often are only able to inoculate 7 logs per 5 lb. bag of spawn! The next step in inoculations is to insert spawn into the holes we’ve just drilled in the logs. To do this we use a tool – oddly enough called an “inoculator”! – that picks up the sawdust spawn, and releases it with when you depress the end of the tool. Our goal is to insert the spawn firmly and cleanly, so that it doesn’t stick up above the bark, yet completely fills the hole. When the log has been inoculated we stack them up in preparation for being laid out for incubation. But more on that later, when our most recent (and hopefully last!) snow has melted.